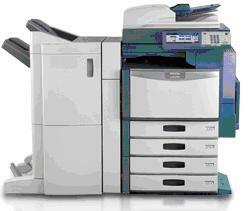 The e-STUDIO3540c/4540c from Toshiba bring mid-volume workgroups impressive color and high-volume black and white, including copy, print, scan and fax capabilities. Now, thanks to the integration of the new generation e-BRIDGE platform, features can be added later"similar to the way apps are added to smart phones. This platform also provides increased security, connectivity, manageability and energy saving. Yet another technological advancement from Toshiba. This changes everything Since todays MFPs are also used as IT devices, the new e-BRIDGE controller provides seamless compatibility with networks and management systems. Administrators can quickly and easily perform initial settings as well various management tasks such as those involving users throughout the system, targeted security, and multiple devices. They can also perform tasks that previously required a service technician like installing multiple systems, upgrading software using patches, cloning, and changing settings. e-BRIDGE allows for seamless integration with core business applications to streamline workflows. It allows you to keep up with changing technology, too. As new applications for advanced features and functions are developed, they can simply be added on.